The Queens native’s latest visual was shot by pioneering style photographers Mert and Marcus. 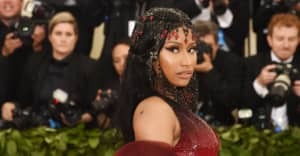 Nicki Minaj has dropped off a brand new video for "Regret In Your Tears," one of three singles that the Queens native released in March. The clip, directed by fashion photography duo Mert and Marcus, finds Minaj posted on a bed surrounded by water. Before the video was released, Nicki Minaj took to Twitter to announce that her fandom has a new name. Instead of their former "BARBZ" title, fans of Minaj will now be referred to as "The Kingdom." Watch the video above, exclusively via TIDAL.